The annual Sri Pada Pilgrimage season begins on Duruthu Pasalosvak Poya with religious ceremonies conducted at Sri Sumana Saman Devalaya, invoking the blessings of the Sri Sumana Saman deity on pilgrims climbing Sri Pada Mountain. The path to the summit of Sri Pada Mountain remained a mystery until it was discovered with the help of the gardener who showed the way to King Nissankamalla of the Kalinga dynasty who hailed from South India. He was the son of King Ghosha and Queen Parvati who ascended the throne and ruled Raja Rata from Polonnaruwa for nine years and visited Sri Pada Mountain during the latter part of his rule. The legend has it that King Nissankamalla climbed the mountain to pay his obeisance at the Sacred Footprint of The Buddha on the summit on the Duruthu Pasalosvaka Poya. There are legends and beliefs related to the worship of the Sacred Footprint. The foreign visitors from far flung lands have climbed Sri Pada Mountain and left their impressions about the sacred summit in their writings. Ibn Batuta was one of the visitors who wrote in his travels how he climbed the mountain terrain. There is a popular belief that butterflies make their journey heading towards Sri Pada Mountain during this season, hence the name Samanala Kanda. Prof. Senarath Paranavithana too had made his observations about the worship of the Sri Pada in his writings. 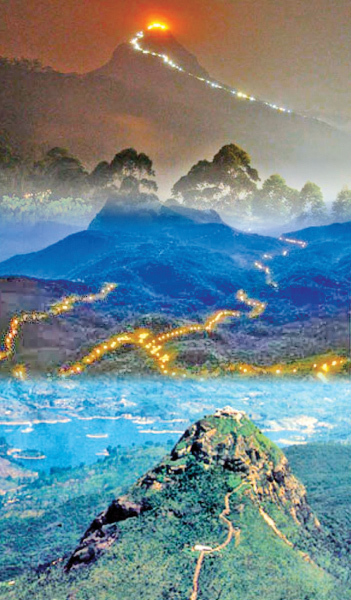 The mountain was sanctified by the visit of The Buddha at the invitation of the Sri Sumana Saman deity and placed his Sacred Footprint on the summit of the mountain to mark his third visit to Sri Lanka. 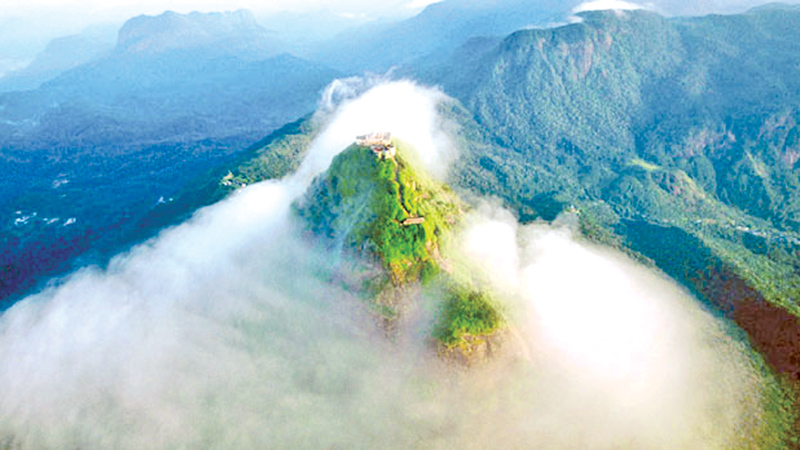 Thus Sri Pada Mountain became one of the most sacred places of Buddhist worship in Sri Lanka where Buddhists visit at least once in their lifetime. It is a common sight to see the arrival of pilgrims in vans, cars, buses and other modes of travel to Nallathanni in the evening and prepare to climb the mountain braving the cold misty weather. Then they trudge across the abandoned tea land and commence their climbing the steep terrain forming into a group called Nade led by a Nade Gura to lead kodukarayas who are those visiting for the first time. ‘Karunavai, Karunavai, Karunavai – May there be compassion’ is a common way of greeting each other while ascending and descending the Sri Pada Mountain by the Nade Guras and rest of the groups. Nade gura begins to chant verses from Thumsaranaya extolling the virtues of the Buddha, Dhamma and Sangha in his sonorous notes which the others in his group following him keep chanting line by line. These chanting make the pilgrims blessed spiritually and uplift their spirits from weariness. Along the path to the summit there are many historic places pilgrims pass through. The road from Hatton is known as Raja Rata Mawatha. After passing Indikatupana and arriving at Seethagangula where icy cold water gushes down from ravines above, forming into water pools, pilgrims usually wash their hands, feet and faces. There is a cave known as Nissankalena. On the summit there is a two acre flat rock surface, Samyaamadama, the resting place of the visiting bhikkhus and below the rock there is a rock cave with a drip ledge carved to drain the rain water preventing it from getting inside the cave. Inside the cave there is a figure of a king standing, said to be of King Nissankamalla and beside it stands the Saman Devale. The king learnt the secret path from a gardener who looked after the royal flower garden. Having found some flowers missing every morning, he decided to be vigilant and kept awake one night and was able to detect the thief who steals the flowers. To his surprise it was a fairy who confessed the flowers were taken to worship at the Sacred Footprint on the summit of the mountain. It is recorded that king Nissankamalla travelled along Raja Mawatha and worshipped at the Sacred Footprint and visited Divaguhava or Bhaghava lena where The Buddha rested lying 300 feet below the summit. It is said the king commissioned a statue of him showing himself worshipping the Sacred Footprint and inscribed a rock inscription in 14 lines. There is also another inscription at Ambagamuwa which was the entrance to Raja Mawatha that led to the route on which king Nissankamalla travelled. The details in the inscription mention that the king donated a number of villages for the maintenance of Sri Pada and to meet the needs of the pilgrims who visited. The inscription said that those who make use of the revenue from these villages for their own needs would be born as cats, dogs and cows in their future births. In addition to Raja Mawatha the other route is Palabaddala. There is another inscription similar to Gilimale which mentions that the revenue from Bambarakotuwa village should be used for those who visit Sri Pada on pilgrimage. Pilgrims climb the steep rocky surface walking on the steps with the help of the iron railings and make their way at snail’s pace till they reach the summit to witness Ira Sewaya - homage of the sun to the Sacred Footprint. The eastern horizon gets lit up with the rays of the morning sun and then darkness. This process repeats and finally the golden disc of the sun appears much to the delight of pilgrims paying homage to the Sacred Footprint.